Washington (CNN) - He's said no over and over again, but now Sen. Jim DeMint of South Carolina is saying maybe to a possible run for the Republican presidential nomination. But an aide to DeMint seems to be downplaying such a move by the senator. DeMint, who helped launch the Tea Party caucus in the Senate and who's very influential with many tea party activists and other grassroots conservatives, says many of his supporters have been urging him to run for the White House, and that he's letting them have their say. 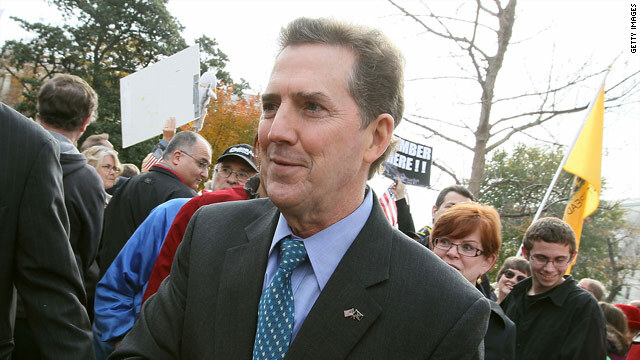 "It's humbling and out of respect, my wife and I have talked about it," DeMint told The Hill newspaper. "Out of respect for the people who have asked us to think about this, that's what we're going to do. I don't want to imply that I'm changing in mind, but I want to consider what all these folks are doing." But a source close to DeMint tells CNN that "the Senator said he would pray about it because it will literally take an act of God to get him into the race. He has been extremely effective in the Senate in terms of advancing conservative principles and helping elect conservative leaders, and that is where his passion is." In interviews this year, DeMint has been saying he has no interest in a bid for the White House. In January, he gave CNN's Wolf Blitzer a flat "no" when asked if he plans to seek his party's presidential nomination. But around the same time several of his closest advisers and political confidantes told CNN that DeMint was at least open to a presidential bid if a suitably conservative candidate fails to emerge from the early and wide-open GOP field. "I think that you can read into it that he sees he has a role in the process and he sees he hasn't completely shut the door," said one DeMint adviser said to CNN at the time. DeMint spoke at a conservative forum in March in Iowa, the state which holds the first contest in the presidential caucus and primary calendar. And later this month he will address the audience at the Republican Leadership Conference. The gathering in New Orleans is shaping up to be a major cattle call of candidates and potential candidates in the race for the GOP nomination. DeMint's backing of little known conservative candidates through his Senate Conservatives Fund in the recent midterm election cycle, such as now Sen. Marco Rubio of Florida, often put him at odds with establishment Republicans. Thanks to his efforts and support of some tea party movement candidates, DeMint developed a national following among conservative activists, a network he would be able to tap if he ran for his party's nomination. Another leg-up for DeMint: he hails from a state that hosts the first southern primary in the race for the White House. But having a favorite son in the race could also have the negative effect of minimizing South Carolina's role in the process by forcing other candidates to skip the state's primary completely. DeMint becomes the second big name Republican to go from "no" to "I'm thinking about it," joining Texas Gov. Rick Perry, who is also a darling of many in the tea party movement. - CNN Political Reporter Peter Hamby contributed to this report. Boy the clowns sure are coming out to play. Play on clowns. Oboma is not going anywhere until his second term ends. Oh thats just great!!! Here is the leader of one of Americas most neglected,and poor state in the country? Their schools in rural S.C. are crumbling on the ceilings. Absolutely the most unregulated pollution and air quality programs I,ve ever seen? All the rural towns "Zero Jobs" Unbelievable poverty!! Oh, He,s a real leader!! lol?????? I live in South Carolina. We'll vote for him for President so we can get a new Senator, who might actually have an interest in doing something for our state. Today I am announcing my candidacy for the Republican nomination for President of the United States. I am a LIBERAL registered Democrat with zero national name recognition and a policy agenda which is contrary to all the Grand Old Party stands for. However, my team of advisors believes that I have roughly the same chance at the nomination as all but two of the current candidates AND exactly the same chance of defeating Pres. Barack Obama in the general election...I'm in it to win it!!! !